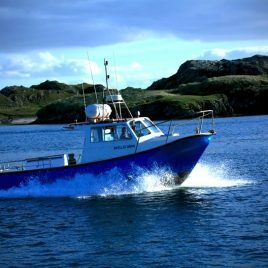 The Skellig Dawn is available for hire for deep sea angling, dive charter, private charter, island tours, water taxi, adventure trips & group bookings. Our boat is an Offshore 105. It is equipped with a 420 HP engine that gives it a top speed of 24 knots. It is fully licensed to carry 12 passengers by the Department of Marine.